Certainly, the number of Africans living in Europe has increased. But, as Asmita Parshotam points out, most African migrants and refugees still move within the region and never leave the continent. The debate on African–European migration is hotly contested, particularly in Europe, where some political leaders manipulate voter fears for their own political purpose while others face criticism for their failure to keep migration “at bay”. Media-fuelled perceptions of European countries being “swarmed” by Africans arouse deep-rooted insecurity about national identity, mistrust of “the other”, racism, and xenophobic attacks. Indeed, the world is witnessing increased anti-migration sentiments, as reflected in Australia’s Christmas Island immigration detention centre, US President Trump’s promise to erect a wall along the Mexican border, growing Israeli actions against African migrants, and South Africa’s own xenophobic attacks against foreigners in recent years. Foreign policy is increasingly inward- looking and aims to serve national interests above all else. Africa and Europe have a complicated historical relationship with migration. While colonial ties and economic opportunities are part of the explanation for the movement of African people into Europe, this simplistic narrative fails to account for complex realities across the African continent; the push and pull factors behind migration, which range from shifting life ambitions among young urban Africans to global phenomena such as climate change; and the fact that not all African migrants (like many migrants globally) want to move to Europe. Against this backdrop, there are ongoing efforts to draft a framework for global migration management, most notably the Global Compact for Safe, Orderly and Regular Migration (GCM), under the auspices of the United Nations. At the level of political rhetoric, at least, this process displays broad support for finding long-term and sustainable solutions. The final draft, released on 11 July 2018, is rooted in an understanding of human rights and fundamental freedoms for refugees and migrants. It clearly demarcates shared responsibilities amongst UN member states, pools resources to address mass migration, and provides a useful update on the important drivers of migration – for example, by reflecting on climate change as part of the explanation for the rise in migration levels. The GCM tackles important issues such as data collection and sharing, establishes coordinated international efforts on missing migrants and, importantly, espouses a human-rights approach to migration through catering for basic services for migrants. In total, it details 23 objectives that will inform the implementation of a global framework for migration management. Unfortunately, the GCM is a non-binding document with no implementation mechanisms in place. This raises the question as to whether UN members will have the political will to implement its measures, such as affording migrants access to social services and benefits. It is equally concerning that the GCM references “national sovereignty” for UN members to determine their domestic migration policies. This leads us back to square one: the absence of binding international minimum standards for the humane and safe treatment of migrants. It is also worth questioning why some of the most powerful UN members have bothered to engage in GCM negotiations while their domestic policies display only increased hostility towards migrants – policies which are then replicated in developing countries under the pretext of “international best practice”. In the absence of implementation mechanisms, the GCM is a toothless watch- dog, unable to enforce change in member countries where domestic immigration laws do not offer protection or rights to migrants. Unless UN states are willing to bind themselves to higher standards and gradually work towards implementing a global system for migration management, it is hard to see the GCM as other than a glorified talk-shop. Behind these political and multilateral developments are wide-ranging misconceptions about African migration. Although it is difficult to dispel myths with statistics, the hard data scarcely tallies with the images of desperate African migrants portrayed daily in European media. 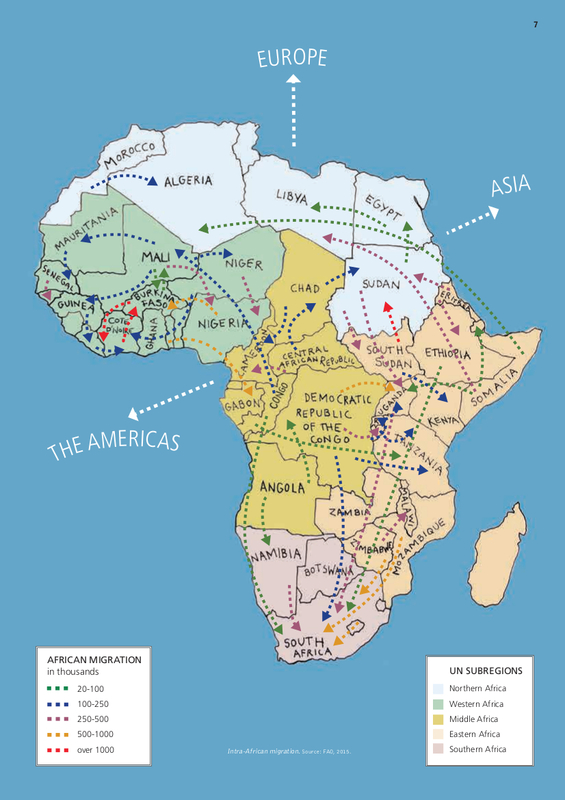 In fact, Africa is the least migratory region in the world. Although the number of African migrants living outside the continent has increased from 6.9 million in 1990 to 16.9 million in 2017 3 (indicating that while intra-African migration remains slightly ahead, this margin is narrowing) such statistics hardly correlate with the images portrayed in European media of migrants arriving on European shores, or requiring rescue from the Mediterranean Sea. Public discourse also fails to consider that recent African migration to Europe is largely due to political and economic instability in countries in the northern and western regions of the continent. Another misconception is that African people who migrate overseas are uneducated or semi-skilled. 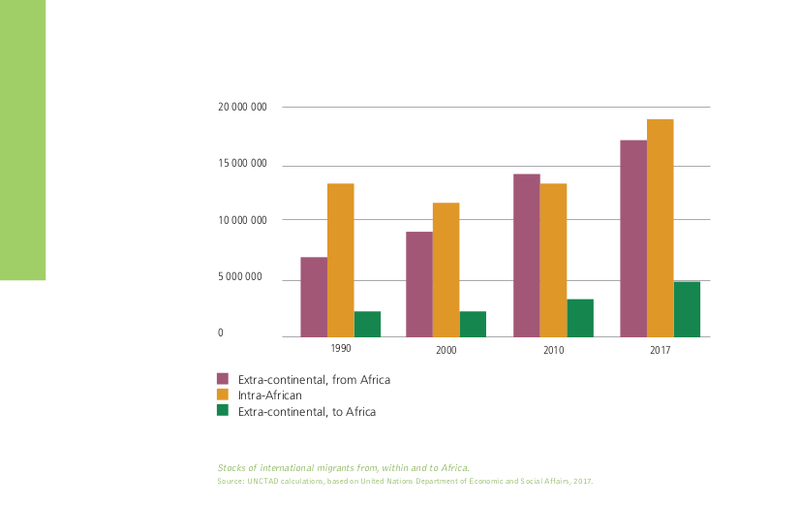 While there has been an increase in non-elite, sub-Saharan-African international migration since the 1990s, semi-skilled migration is still largely confined to continental movements. Those who travel outside the continent are often well-educated, moving for work or educational purposes, and they often continue to send money back to their families at home. Across sub-Saharan Africa, diaspora transfers to countries of origin were estimated at $34 billion in 2017 alone. 4 Ethiopia’s diaspora has one of the most successful remittance programmes, with contributions rivalling (and exceeding) official development assistance to the country and directly contributing to the country’s socio-economic development. Nigeria’s thriving, educated diaspora across the United States and the United Kingdom has played an important role in dispelling myths about migration and education levels amongst African migrants. African leaders must share the blame for the state of the international migration debate. They have been unable to coordinate and lobby at the UN level for solutions that speak to African countries’ needs, nor to find comprehensive solutions amongst themselves that would reap greater rewards for growth and employment. 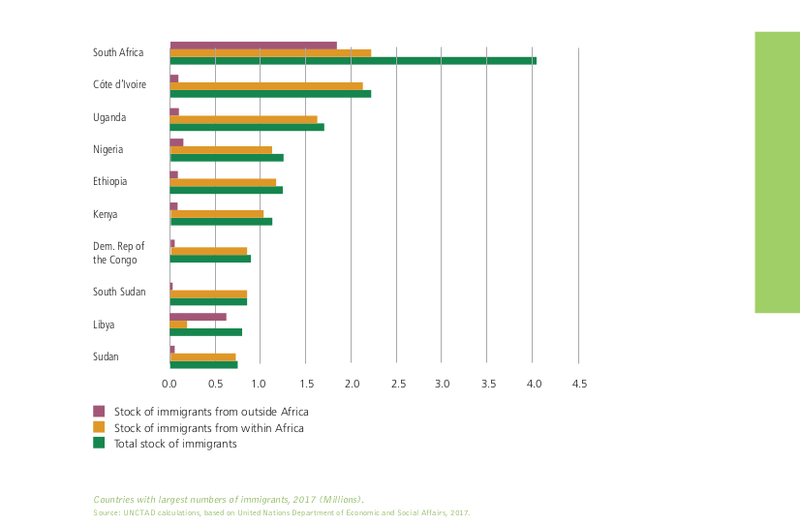 Politically and economically powerful countries such as Kenya and South Africa are not taking the lead to lobby for a more institutionalised form of intra-African migration. Although the African Union has formulated promising and progressive migration policies that clearly recognise migration as a tool for development, African countries are often themselves unwelcoming of African migrants. How can there be realistic and implementable multilateral resolutions when African countries have, thus far, been reluctant to really engage with the issues themselves? An alternative view is that African countries can’t properly set a migration agenda amongst themselves because of their vastly different economic levels of development and the benefits they reap from migration. For one example, 10 percent of Mali’s GDP is directly funded from the diaspora. 6 For another, migration agreements between the EU and African countries offer development assistance in exchange for the repatriation of migrants – much to the chagrin of local civil society organisations who vocally oppose increased dependence on EU assistance. European and African leaders are on a slippery slope to a dangerous destination, with repercussions that none are fully prepared for. In their migration agreements with countries like Libya and Turkey, EU politicians find themselves “supping with the devil”, which in turn undermines their image as promoters of human rights and protectors of the Western liberal order. Increased domestic anti-migration tactics – such as Italy’s and Malta’s refusal to allow migrant ships to dock, or Denmark’s new forced-assimilation laws – reflect societies in which human rights are increasingly afforded only to those with the correct profile. 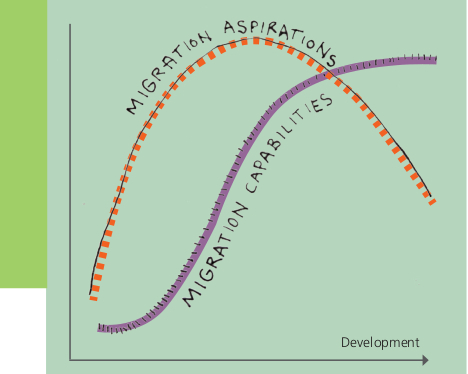 In African countries, the continuing failures of political leaders – to resist outside pressures, to improve their protection of migrant rights, to entrench domestic political stability, and to increase socio-economic and employment opportunities for their burgeoning youth populations – are likely to accelerate existing migration trends, and to further undermine the possibility of forging a progressive and effective African position on migration. What is urgently needed, therefore, in both Europe and Africa, is the political will to push for implementation of the Global Compact for Migration and to achieve its agreed objectives. Real solutions need to be found for refugee-hosting countries, especially for those without the financial or technical resources to undertake this mammoth task alone. The World Bank and the African Development Bank must identify financial mechanisms that can assist host countries with infrastructure development to enable refugees to live in humane conditions. Stronger political support is also needed for migrants’ socio-economic development, including educational, financial and employment opportunities that enable them, in the long term, to contribute to their host communities. At the end of the day, migrants who are displaced by political or economic upheavals are innocent individuals in search of a better life for themselves and their families – and they are the ones who will pay the highest price if the political inertia of European and African leaders is allowed to continue. 1 United Nations Conference on Trade and Development (UNCTAD), Economic Development in Africa Report 2018: Migration for Structural Transformation, 2018. 2 United Nations Economic Commission on Africa (UNECA), Situational analysis: patterns, levels and trends of African migration, draft report prepared for the African Regional Consultative Meeting on the Global Compact on Safe, Orderly and Regular Migration, Addis Ababa, 26 and 27 October 2017. Available at: https://www.uneca.org/sites/default/files/uploaded-documents/SocialDevelopement/Global-Compact-Migration-2017/situational-analysis-migration-report_english.pdf. 3 UNCTAD, 2018, op. cit..
4 Robert Schuman Foundation, European Union/African Cooperation: The Externalisation of Europe’s Migration Policies, April 2018. Available at: https://www.robert-schuman.eu/en/european-issues/0472-european-union-afri-can-cooperation-the-externalisation-of-europe-s-migration-policies. 5 De Haas H et al., UNECA African Migration: Draft report prepared for the Africa Regional Consultative Meeting on the Global Compact on Safe, Orderly and Regular Migration, October 2017. Available at: https://www.uneca.org/sites/default/files/uploaded-documents/SocialDevelopement/Global-Compact-Migration-2017/governance-of-migration_english.pdf. 6 Robert Schuman Foundation, European Union/African Cooperation: The Externalisation of Europe’s Migration Policies, April 2018. Available at: https://www.robert-schuman.eu/en/european-issues/0472-european-union-afri-can-cooperation-the-externalisation-of-europe-s-migration-policies. This edition of Perspectives seeks to shed new light on aspects of the movement of African migrants that have remained on the margins of discussion, and to place the pressures experienced in Europe within a broader perspective. In Kenya, the United Nations High Commission for Refugees (UNHCR) is seeking to break new ground. In a clear departure from the humanitarian aid approach of the past, a new initiative aims to promote self-reliance among encamped refugees and local host communities alike. Although supportive of its ideas, Felicity Okoth is quick to identify a number of policy and political obstacles to its implementation.